I've always been a pretty sentimental type of gal. The quickest way to my heart is to show me that you put a lot of thought into something for me, whether it's a hand-written poem or cooking my favorite meal. Thoughtful gestures and gifts go the longest way with me because they are usually the things I will never forget. One of my favorite things I remember that my husband did for me was on my 21st birthday. He created a slideshow telling me all of the reasons he loves me and it had pictures of us from the beginning of our relationship until then. It was so sweet, so thoughtful, and so personal! I will never forget it. I'm telling you guys, thoughtful and personalized gifts are the way to go. If you have followed Through Jam's Eyes for awhile, you will know that I am obsessed with anything with my name on it, from monograms to single initials. To me, it just makes me feel like it is MINE and no one else can have it (personal). 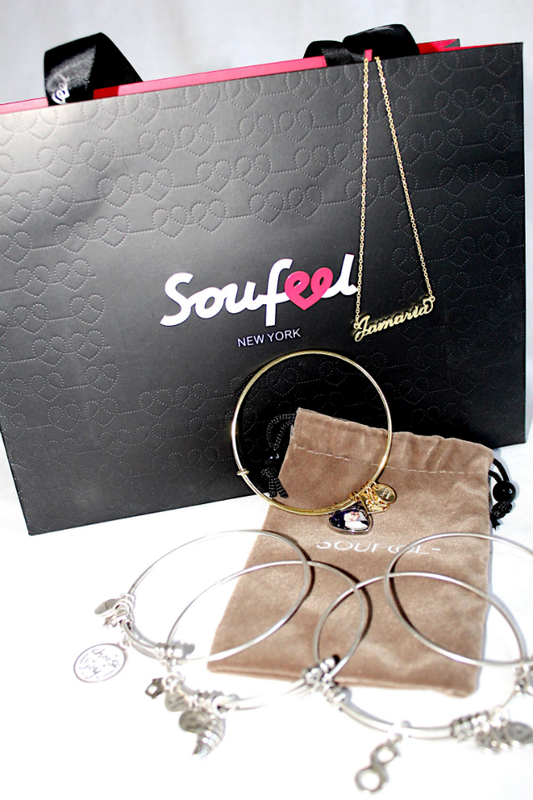 When I was contacted by Soufeel to check out some of their jewelry, I felt like a kid in a candy store because I was SO excited to create some personalized jewelry specifically for me, and now I'm excited to share it with you guys. At the end of this post, I'm going to share a nice little coupon code with you all too and trust me, you're going to want to go right over to their site to shop! Okay, enough anticipation, let's just get right to it! 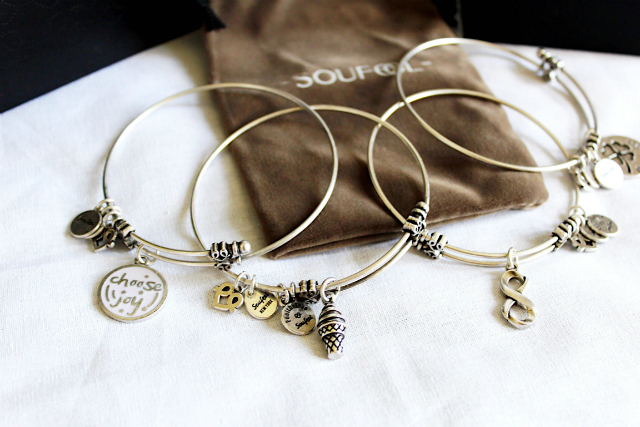 First, I want to show you guys my beautiful charm bangles that I selected. 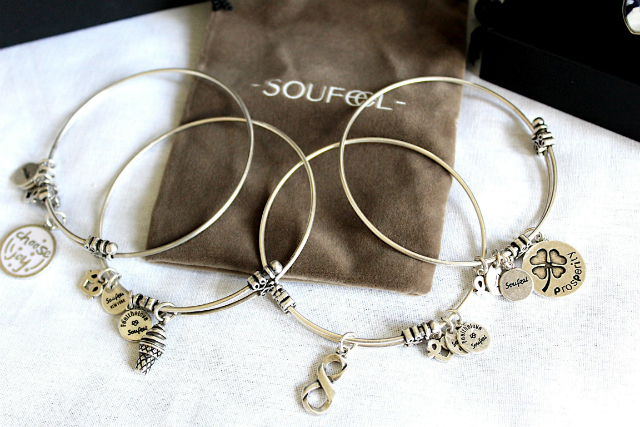 I chose these because each one means something to me and every time I wear them, I am reminded of those meanings. 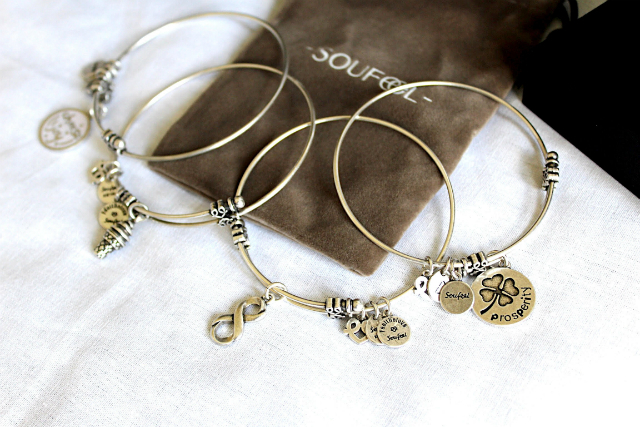 I chose four silver bangles; one that has a charm that says 'choose joy', one with an ice cream cone charm, one with an infinity charm, and one with a four leaf clover charm that says 'prosperity'. I love these so much because I can wear them separately or together and when I look down at them, I am reminded of a specific time in my life. You'll be surprised how you can look down at a simple piece of jewelry and it instantly lift your spirits, especially when it is thoughtful and personal! 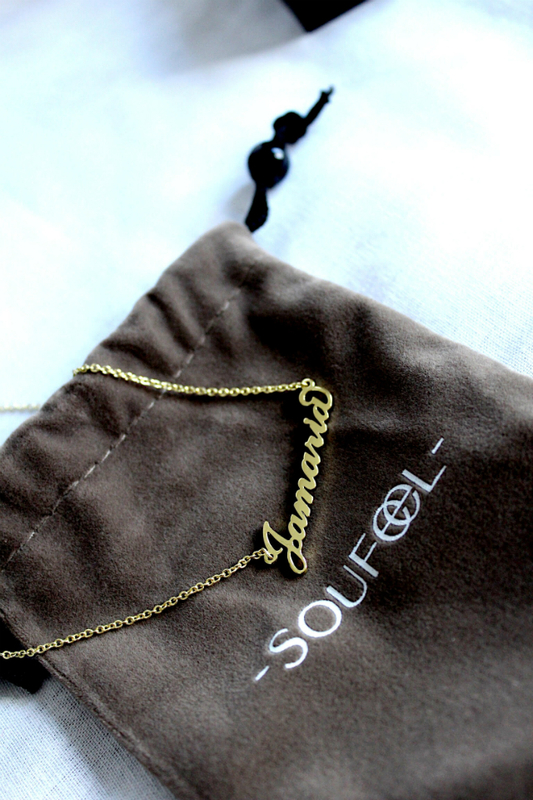 Next, I chose a personalized name necklace which I LOVE! I have a couple monogrammed necklaces, but I did not have one that spelled my whole name! This is super special to me because I can NEVER find my name at a store where they sell necklaces and jewelry like this. 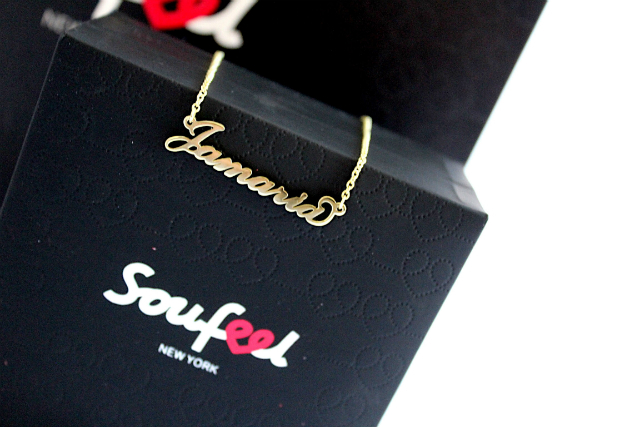 'Jamaria' is not a common name, so I could never easily buy it. However, being able to personalize one myself is even better! Now, I saved the most sentimental piece for last. This is something I will seriously treasure and keep for the rest of my life. I was able to personalize a charm bracelet with a picture of my husband and I from our wedding! Talk about tear-jerker, right?! 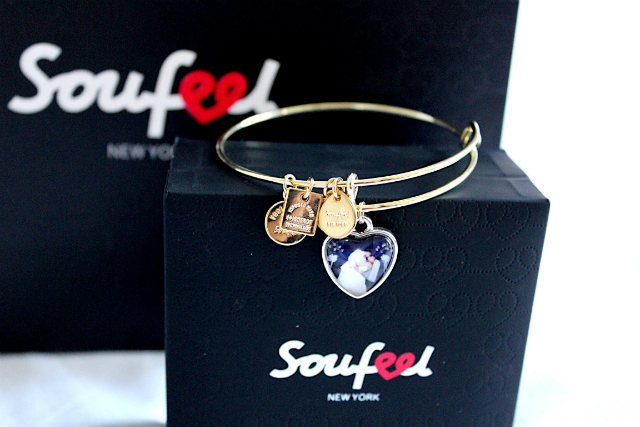 I can't even find the words to describe how much I love this photo charm bangle! It's probably not something I will wear everyday, but on the days I do decide to wear it, I will constantly be reminded of one the best days of my life. 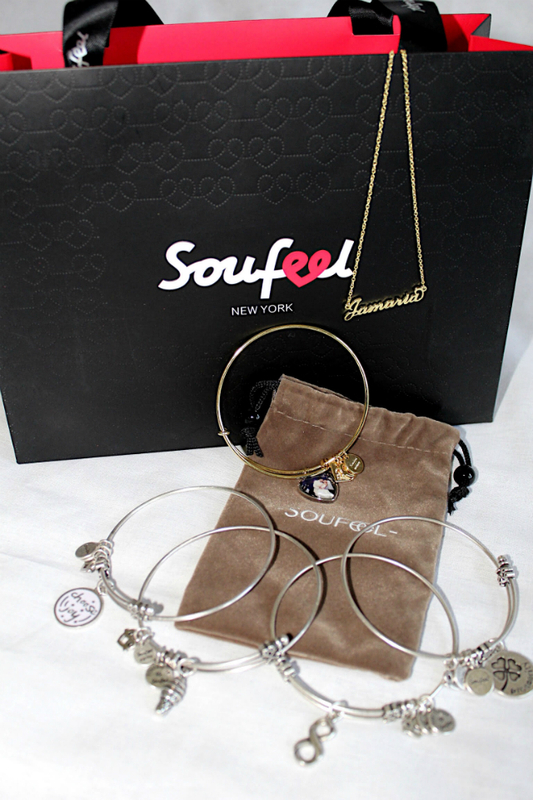 All of this jewelry would make perfect gifts for that special woman in your life. Whether it be her birthday, Mother's Day, Valentine's Day, Christmas (it's coming up guys, VERY SOON! ), or even a 'just because' gift. 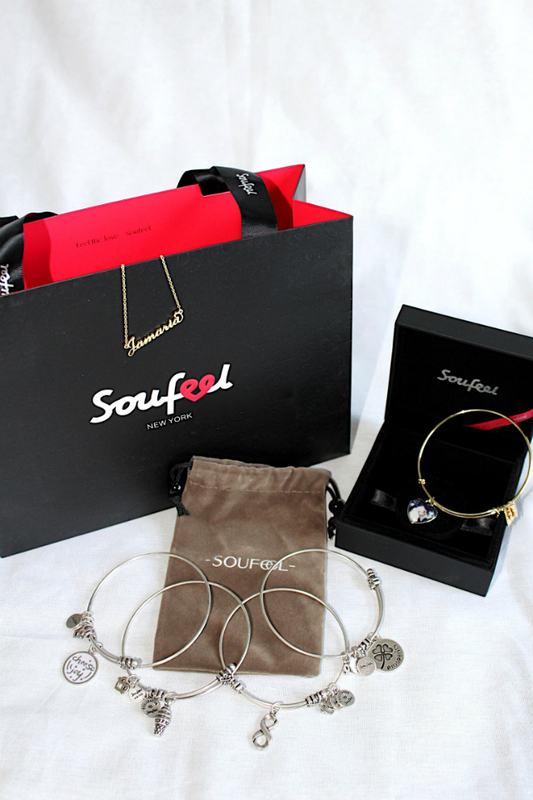 Soufeel has so many amazing options to choose from, you'll just have to visit their site and check it out for yourself! Now, I know y'all are probably like "Jamaria, it's WAY too early to be talking about Christmas! ", but if you guys REALLY know me, then you know I've already started my Christmas shopping and you should too! After all, the early bird gets the worm, in all scenarios! 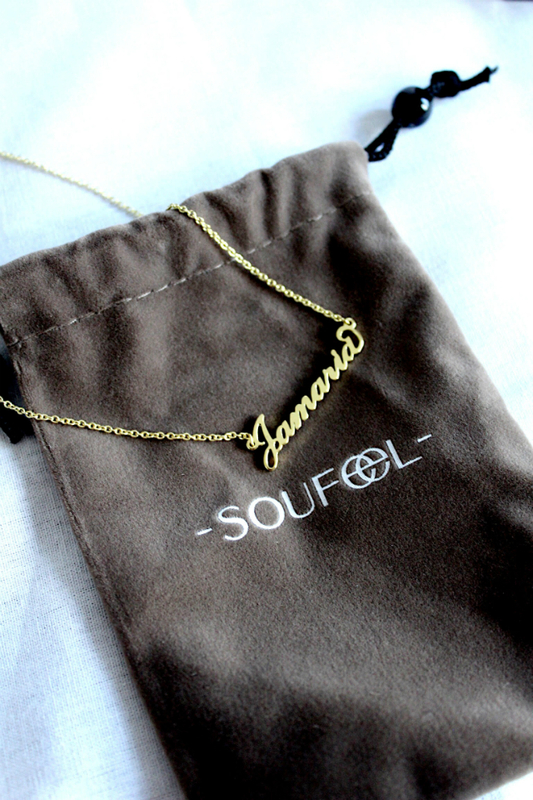 :) So, go ahead and visit Soufeel's site by clicking here and while you're there, you can take 10% off of your order from now until October 11th with the code 'Jamaria10'. I'm obsessed with the necklace! What fun and unique pieces! i'm obsessed! i love these jewelry pieces! These are such cute pieces. Perfect for gifts! 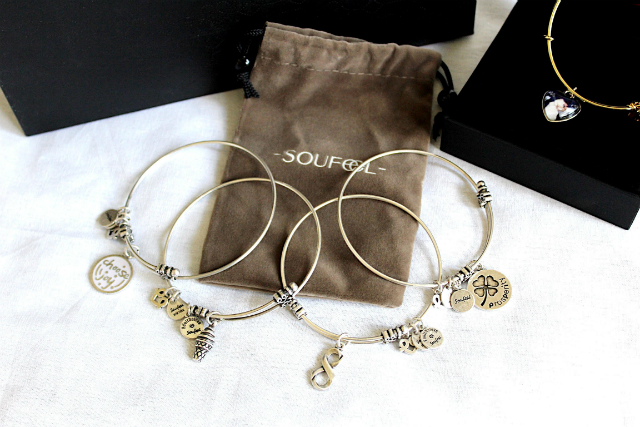 I'm all about sentimental gifts too- love the bracelet with the little ice cream cone!! These make for such great gifts! Perfect time of year too - I love them all!